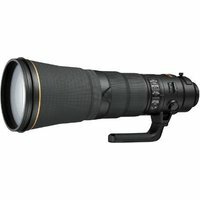 The 600mm f4 VR lens from Nikon incorporates two fluorite lens elements and a host of high performance technologies to deliver the world's lightest FX compatible super-telephoto lens. The new optical design means the weight and size can be kept to a minimum, resulting in a more manageable weight of just 3810g, which is an impressive 1250g lighter than its predecessor. Additional enhancements include a Sport VR mode, improved AF tracking and an updated Vibration Reduction (VR) image stabilisation system to combat the effect of camera shake and allow shooting at up to 4 shutter speeds slower than would otherwise be possible for dramatically sharper still images and video capture.